Hello, friends! 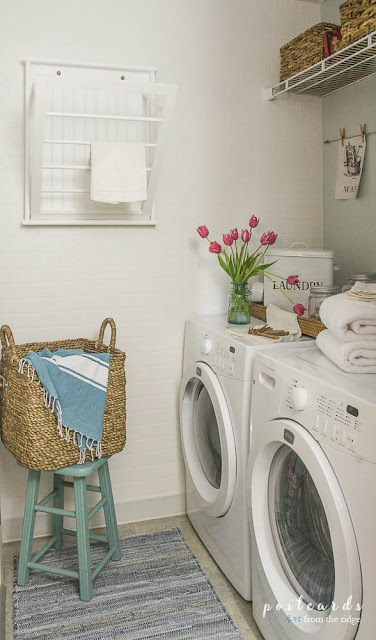 Do you remember earlier this month when I shared the plans for a makeover in our tiny entry? I'm participating in the $100 Room Challenge, hosted by Erin at Lemons, Lavender, and Laundry and have missed a couple of weeks sharing updates with you, but I've finally finished it. 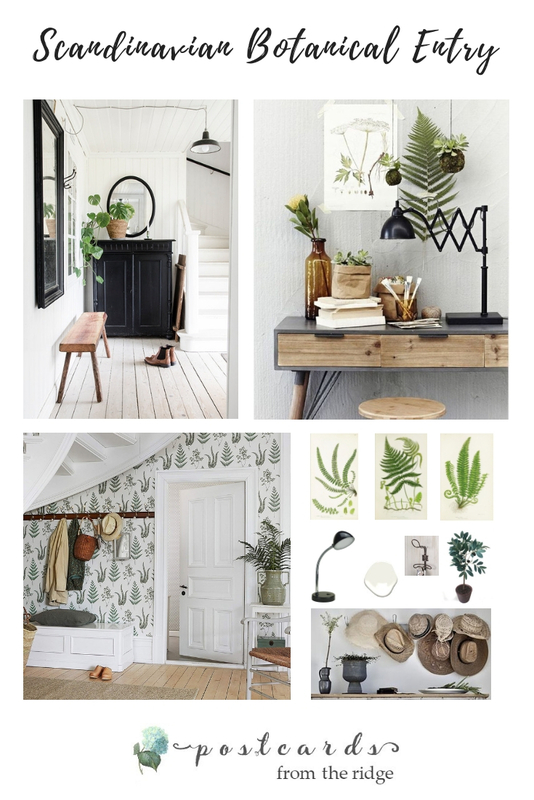 We now have a Scandinavian inspired, fern botanical entry and I love it! And the best part? I only spent around $78. Needless to say, sometimes there are perks to having a large stash of paint and supplies in the garage. Today I'm sharing how I got this look on a small budget. 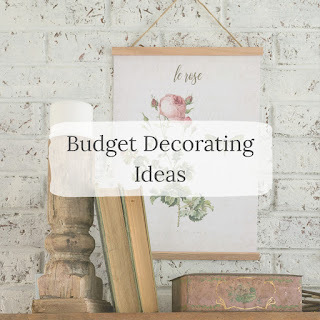 There are also lots of other great budget-friendly projects linked up at the bottom of the post and you'll want to check them all out. Here's what I did to our little entry. Using mostly things I already had, I refreshed the space without spending much at all. 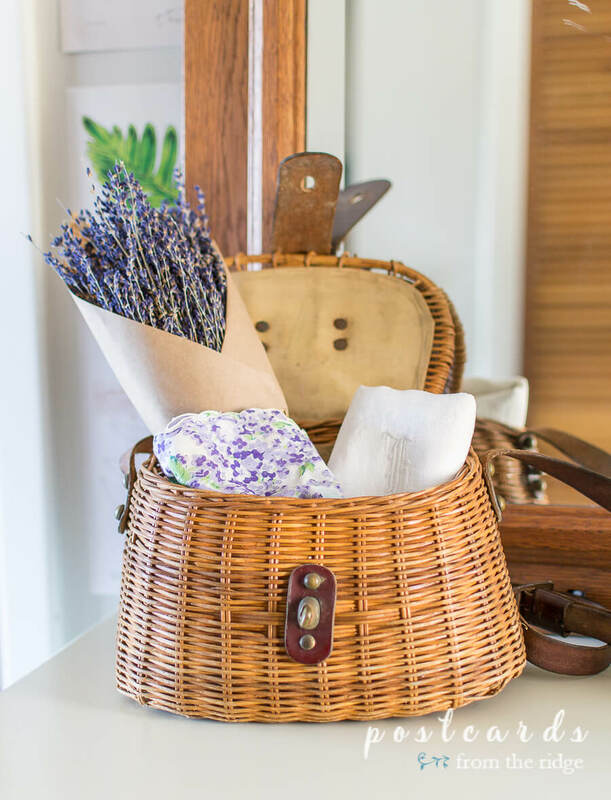 I shopped the house and used a vintage fishing creel, a lavender bunch, and some vintage linens on top of the white desk that was already in here. The antique mirror and lamp were also already in here. I had found another vintage goose neck desk lamp that I had planned on using in here, but it just didn't look right. I'll find another home for it. Stay tuned for that. The vintage green books have been used in the guest bedroom and other rooms, so I simply relocated them to this space. 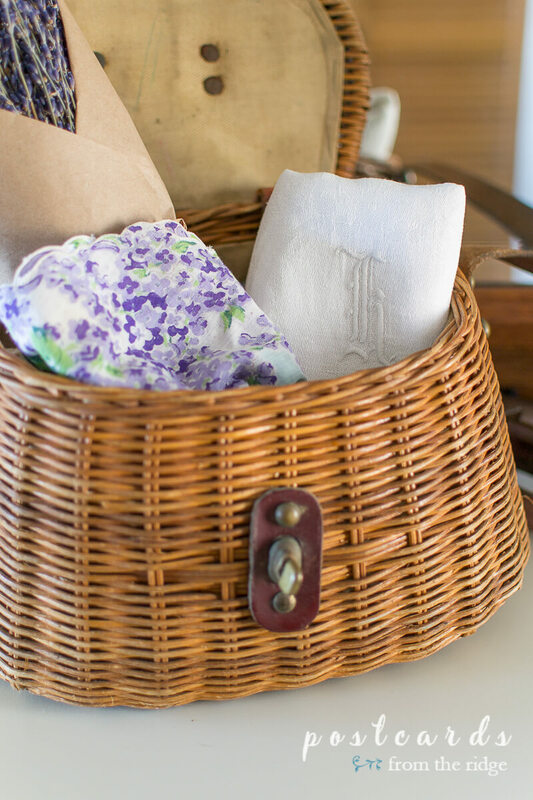 Underneath the desk, I added a large basket that I found at a yard sale years ago. It had been in the basement with the girls' outgrown toys in it so it was time to do something else with it. I've got a use-it-or-lose-it mindset in our home right now and I'm happy to find a new use for it. 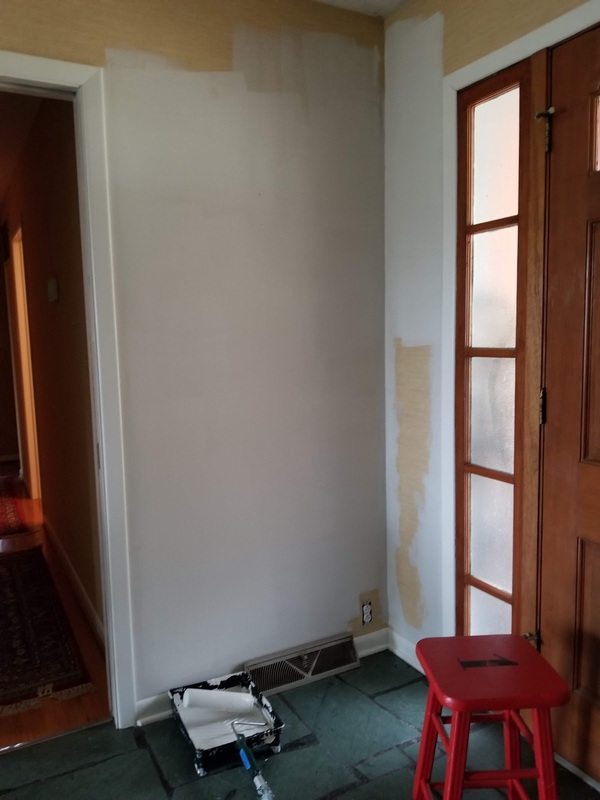 A reminder of how it looked before I repaired the damaged wall and patched the wallpaper. And a peek at the wallpaper being painted with primer before I painted it with the paint color. 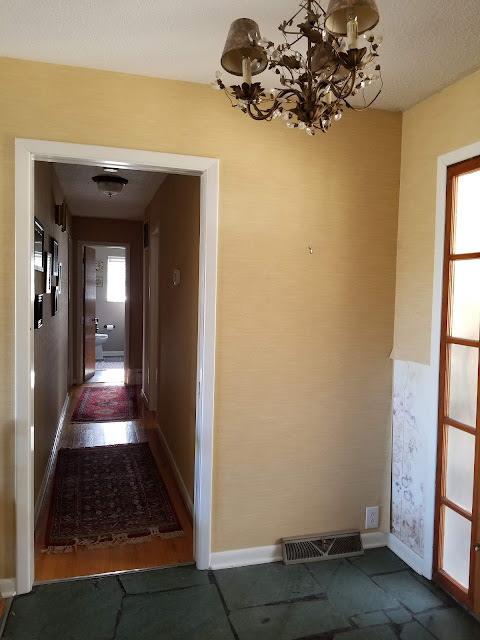 Painting over the wallpaper wasn't a lot different that any other painting project besides using a specific type of primer. Once I repaired the wallpaper I used this primer. And after the primer dried, I used this paint in the pearl finish, tinted to Benjamin Moore Collingwood. Here's the progression of the prints being attached to the walls. I used this poster putty to adhere them. I can change them any time I want to and there won't be any holes. The prints were too tall to go over the doorway, so I used some that looked okay turned sideways. I also used some bird prints that I cut out of an Audobon society journal that I found at a used book store several years ago. I think they go perfectly with the ferns and natural theme, don't you? Another thing that looked nicer than I anticipated is the prints against the wood mirror and frame around the door. The brown in the prints really complements the wood tones. I love it when things like that happen. Below is my original inspiration board for the space. I wanted to hang some straw hats but there just isn't enough space. And I have a larger piece of furniture I was going to use but it was too much so I kept the white desk in here. I still think it turned out pretty close, don't you? $0 - Paint, primer, painting supplies. I already had these on hand. I used several sample pints of paint mixed in with some leftover bathroom trim paint to create the wall color, Benjamin Moore Collingwood. $2.78 - Poster putty. I used his to adhere the prints to the wall. I can change them any time I want and there are no holes! 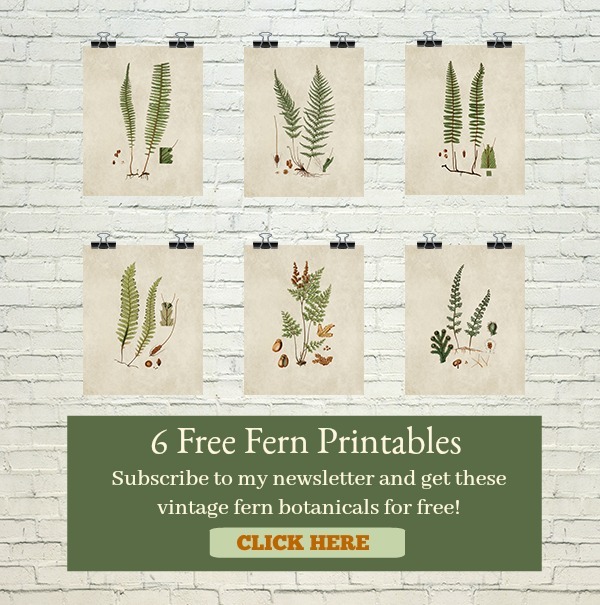 $18 - Fern prints. I spent hours locating these and then had them printed at a local print shop. $56.62 - Paper trimmer. Although I'll be using this for mulitiple future projects, I purchased it for this project and am counting it in the budget. $0 - Lamp, desk/table, basket, green bottle, oak mirror, - I already had these items on hand either in this space previously or in other rooms. In case you're interested, I'm working on putting together of kit with a variety of the fern botanicals that I used on the walls. It will be enough to cover an accent wall or small space. They will be printed on heavy paper and will be precut. I'm not sure how much they'll cost, but I'll make them as reasonable as possible. Sign up for my newsletter if you're interested and I'll notify you when it's available. So what do you think of my "new" botanical fern entry? Leave me a comment below and let me know! And don't forget to keep scrolling to the bottom of the post to see all of the budget friendly projects. For your convenience, I've put together a group of items you can use to get this look in your own home. Go HERE to see the entire collection. Want more budget-friendly decorating ideas? Go HERE for dozens more tips and tricks. It looks beautiful, Angie! I love how the fern printables look on your wall. Seeing this picture makes me believe that spring isn't too far away. Thanks, Paula. It's sooo cold here today, only 25 degrees! I can't wait for spring to get here! Angie, this is so lovely! 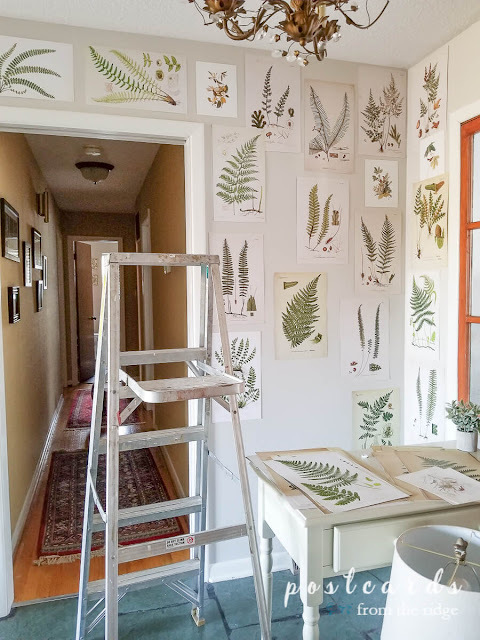 I love everything you did, especially the fern prints! The green is so pretty on our -30F day! Thanks, Linda! Yes, I'm trying to think green and spring with this frigid weather. I'm with Paula. Your entry makes me excited for spring. You are right about the brown in the prints complimenting the wood. I never would have thought to do something like this. So creative and I especially like that you can easily replace your "wallpaper". Thanks, Kelli. I'm also very ready for spring! And I was pleasantly surprised by how nice the prints look with the wood in here. Plus the fact that I can easily change them at any time makes them one of my favorite DIY's. 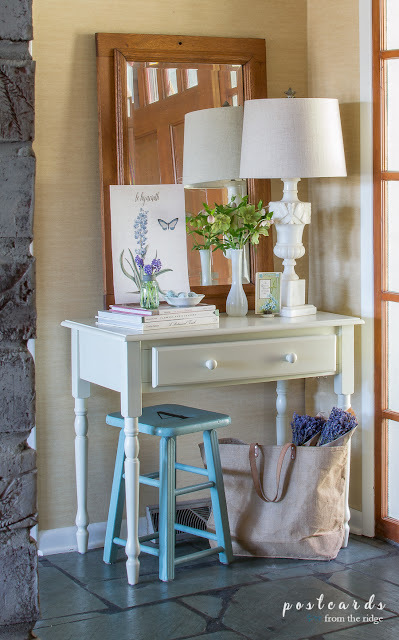 This little entryway packs a huge punch! It's my favorite makeover so far! Love love love it! I have to have those prints, I'm swooning over the whole thing. Thank you, Nicki! It's small but mighty, lol. There's basically no solid wall space besides what you see here. Mostly doors. Have a great day! This is gorgeous!! 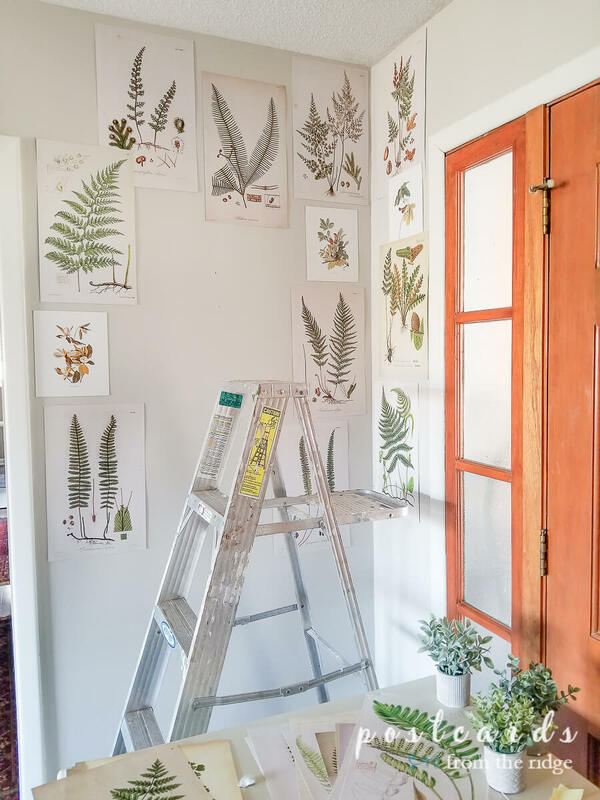 Now you are making me want to decorate my entire house in botanical prints. Great job! Haha, thanks! I would have them in every room if I didn't think I'd get tired of them. Maybe I will anyway. They're easy to change! 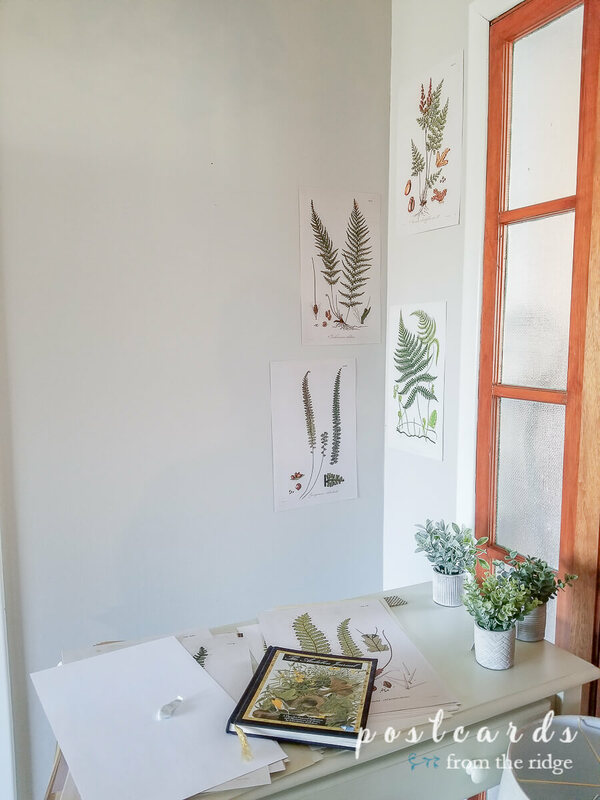 I love all your botanical prints and everything will surely make people stop and smile and look. Thank you, Marlene! It sure does make me smile! I LOVE a bright and inviting entry way and this absolutely is! great job! Thanks, Carmen. It's so much brighter now. And I'm glad you think it's inviting too! I have been looking forward to this reveal and you did not disappoint! 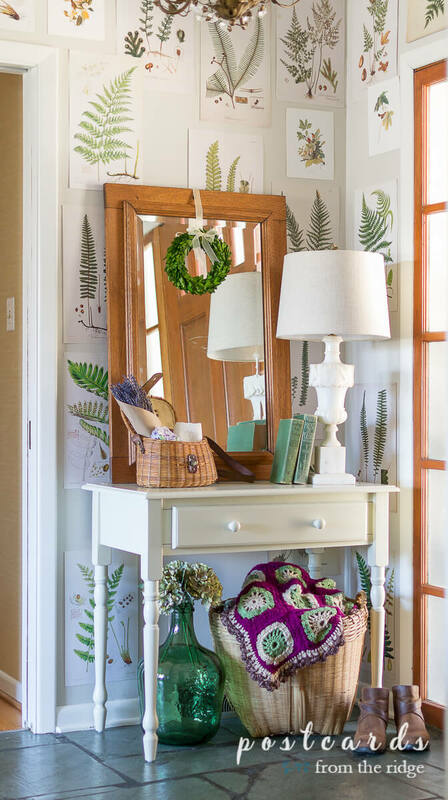 This is such a fantastic use of botanical prints. I love how light and bright it is, but also warm and welcoming. Great job! Thanks, Beth. I love using botanical prints and I can change these out any time I want to. Have a great weekend! Oh these prints are darling. I love!! Your entryway is like a breath of fresh air and simply amazing! Sharing on FB! Thank you so much, Jane! You're so sweet! This is such an amazing makeover! 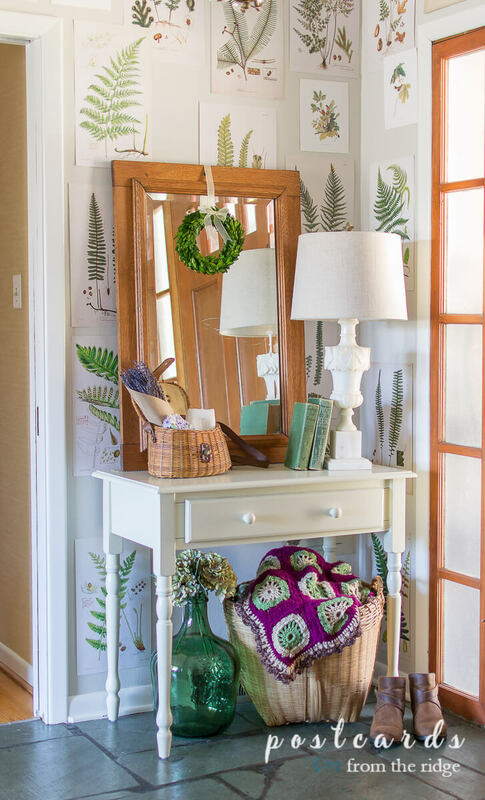 I love the wood tones and the fern prints. You gave a small space BIG style! Congrats! Thank you Jackie! It's definitely small but needed some style added to it for sure. Thank you so much, Kristine! It definitely freshened things up in here. 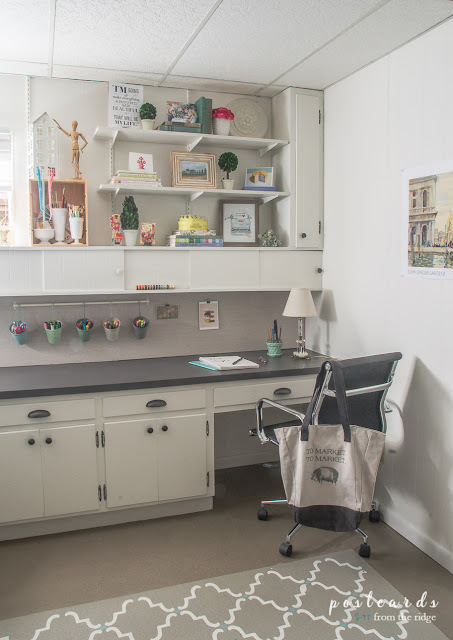 And my craft room makeover was one of my favorites too. Hoping to spend more time in there creating things this year. Perfection! 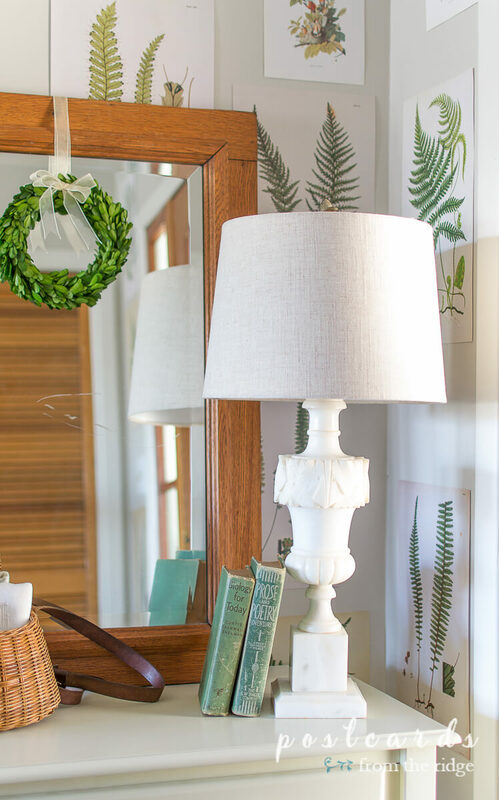 I am really in love with a basic white room with touches of bright green! That green jug underneath is awesome. Thank you, Nikki! There's nothing like white with green to freshen up a space! And I love the jug too. I was so happy to find it! I instantly spotted and was drawn to the granny square crochet throw! I am so glad you found the perfect way to display it and it brings such a pop of Spring to the space with all the prints. Beautiful reuse of things you had. Thank you, Pamela! I knew I'd find a good spot for it eventually and I love it there. It's always good to be able to shop the house! What a unique way of giving the look of botanical wallpaper, Angie! Great idea, and your entry looks lovely! Thanks so much, Julie. When I get tired of it, it will be much easier to change than actual wallpaper! Love it, so so cute! Pinning! This makes my heart pitter-pat! I just love botanicals. Thanks so much, Larissa! Me too! We are moving soon. You have inspired me on how I can create a fresh new space. I have ALWAYS loved botanicals. Thanks for the free printables! Thanks, Meegan. Good luck with your move. Can't wait to see your new place. Enjoy the printables! Angie, OMG this is so good! How clever to use the fern prints almost as wallpaper. The lamp is also fantastic. Beautiful reveal! Thank you so much! Yeah, it's like faux wallpaper since I can change it whenever I want! I love this! I actually didn't realize you could paint wallpaper, but this turned out amazing! And those botanical prints are beautiful. 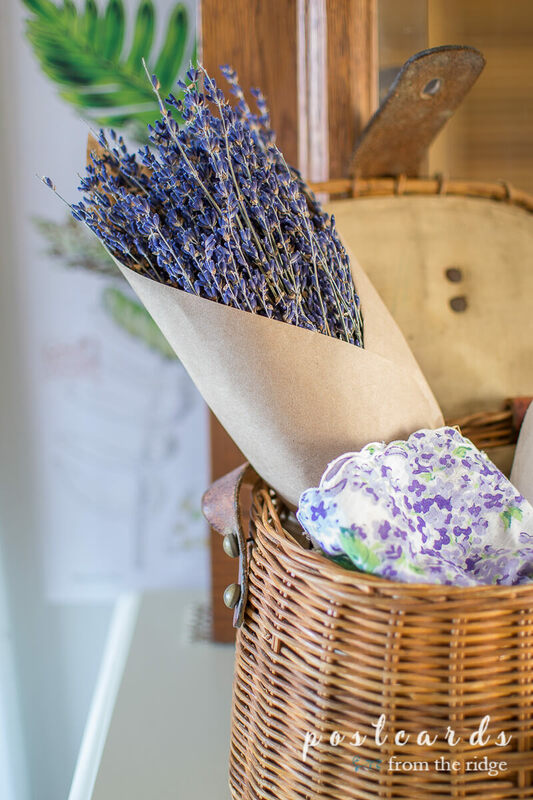 I popped over to your shop because I bought a bundle of dried lavender years ago and have been wanting to buy more (because I love it and use it everywhere), but I could never find it again. I am so excited to see that you sell it. I'm bookmarking the page to buy some this spring. YAY! So excited to have you join the challenge this round!